As the name suggests, it is a minacity inside the city. 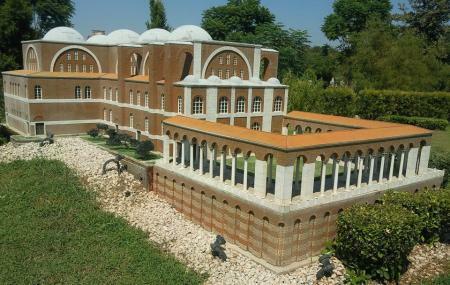 Located in a large space a little away from the beach park, Minicity Antalya is a museum with miniature models of varied popular buildings and sites of Turkey. The park like the museum is located in a growing residential area along Konyaalti beach coastal road, just next to SU hotel. Coming here, you will be greeted with green landscape and varied quarter scale models nestling within it. The models are a physical depiction of Turkey’s some very famous architecture pieces and natural gems like Pamukkale and Cappadocia. Once you are done with a stroll through its lanes, you can go to the open bar at the northern edge of the park and relax for a while. If not, just on the opposite side in the southern edge lies entrance centre with shops, exhibition hall and food joints to entertain. Ensure to stop for a moment and admire the beauty of the entrance hall. Love this? Explore the entire list of places to visit in Antalya before you plan your trip. Fancy a good night's sleep after a tiring day? Check out where to stay in Antalya and book an accommodation of your choice. How popular is Minicity Antalya? People normally club together Termessos and Murat Pasa Mosque while planning their visit to Minicity Antalya. It's quite beautiful. A must see at Antalya.